Support P:EAR this holiday season! Here are a few more details about Bolt's Fifth Anniversary Sale coming up the weekend of the 22nd, 23rd, and 24th. First off, all fabric will be marked down 10-50% for all three days. This includes all new fabric that has been arriving the last few weeks. On FRIDAY (while supplies last) we'll be giving away a Anna Maria Horner apron with purchases over 100 dollars and Modern Domestic will be throwing in a free hour of sewing on their wonderful machines with every 50 dollars spent (you'll need to keep your receipt to take advantage of the MD offer). Also on Friday, we will be donating a portion of all sales to our Organization of the Month, Coffee Creek Quilters. On SATURDAY all books and patterns will be 20% off and on SUNDAY all notions and trims will be offered at the same 20% discount. Word on the street, is that Alicia Paulson is doing a special in-store appearance at Modern Domestic in early December, so you may want to stock up on her books and replenish your embroidery supplies. Elizabeth Hartman's new book is nearly here (hopefully in time for the sale) and we'll have details about her booksigning soon. And while we're on the subject of special guests, there is still room in Kata Golda's Stuffed Companion class down at MD. New this week: City Weekend by Oliver+S and Moda is here! You can read more about the entire collection and ways to sew with it, here. 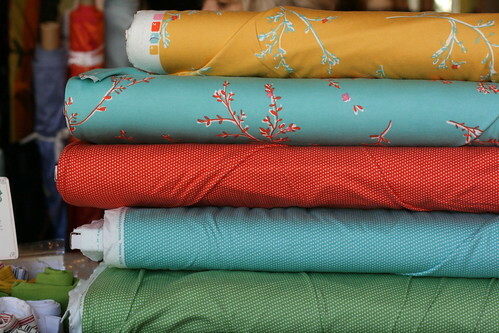 Pictured above are just some of the quilt weight cottons and a cheery stack of very soft interlock knits. Raglan Ts all around! This month's Organization of the Month is Coffee Creek Quilters. Amy, from the store, introduced the group to the shop and we're glad she did so! It's a great organization and one that many of us could easily support just by cleaning up our overloaded stash baskets/ drawers/ bins, whatever method you maintain. A portion of our sales from the first day of our big, store-wide sale, starting Friday, October 22nd, will be donated to CCQ. Please come out and help us support them! The mission of Coffee Creek Quilters is to use quilting as a vehicle for incarcerated women at Coffee Creek Correctional Facility to learn life-enhancing skills, such as patience, perseverance, problem-solving, and the importance of quality work. Students also learn basic math, color theory, and have the opportunity to explore their creativity. In the process, the women develop self-esteem and self-confidence, which we hope will improve their opportunities for success after they leave prison. The program is entirely run by volunteers. Over 20 volunteers teach in one of four weekly two-hour quilting classes held inside the minimum security area of the prison. Eighty students attend one of these classes and the waiting list to get into the program is long. In order to build relationships, each student works with one primary instructor. As our founder Koko Sutton said, “It’s more about the conversation than the quilting”. Students attend class for 12-18 months during which they make three quilts. The first two are donated to a variety of charities and the third quilt is for her or a loved one. Each year, students make approximately 120 quilts that are donated to nursing homes, hospices, children’s programs, and other organizations. One of our volunteers takes pictures of the two donation quilts so each student has a photograph of their work to keep. The majority of our students have experienced interpersonal violence, homelessness, and the absence of a positive role model growing up. Most have mental health and substance abuse concerns and many suffer from chronic medical conditions. Very few have ever used a sewing machine let alone made a quilt. However, initial fears soon give way to pride over a good quarter-inch seam, points that match, and their first block. When students finish their first quilt, the most common thing we hear is, “This is the first time I have ever finished anything! “ Everyone stops and applauds when finished quilts are held up by a beaming student. The importance of finishing the first quilt is universal. One woman said, “Making my first quilt gave me the self-confidence that I could finish something”. Another recurrent theme is feeling “normal” in class. We are often told this is the only time they feel like normal women, being with and doing things “normal” women do. Many tell us quilting is the best two hours of their week. Giving back to the community is also very meaningful to our students and they often speculate about who the recipient of their donation quilts will be. Women never fail to thank the instructors before leaving class and continuously let us know how important it is to them that we “show up” every week for them. 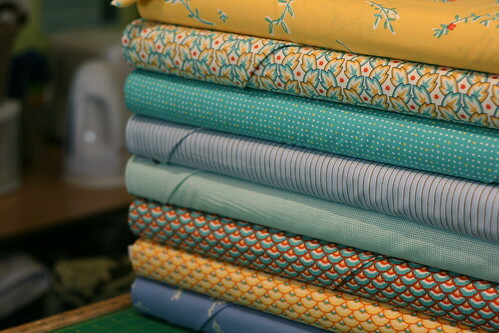 We rely on fabric donations for our quilts – 100% cotton, half yard or more, preferably pre-washed. Our volunteer opportunities include teaching, fabric sorting, quilt-kit making, fundraising, and public relations. We need donated sewing machines, basic notions and fabric for a quilt project to give eligible students when they are released. These “release kits” are described in our brochure and web page.